Lindsay, Peter 2018. Re-envisioning property. Contemporary Political Theory, Vol. 17, Issue. 2, p. 187. Christmas, Billy 2017. Incommensurability and property rights in the natural environment. Environmental Politics, Vol. 26, Issue. 3, p. 502. Lindsay, Peter 2015. Ownership by Agreement. Political Studies, Vol. 63, Issue. 4, p. 935. Sobel, David 2012. Backing Away from Libertarian Self-Ownership. Ethics, Vol. 123, Issue. 1, p. 32. Fox, Glenn 2012. The Origins, Nature, and Content of the Right to Property: Five Economic Solitudes. Canadian Journal of Agricultural Economics/Revue canadienne d'agroeconomie, Vol. 60, Issue. 1, p. 11. 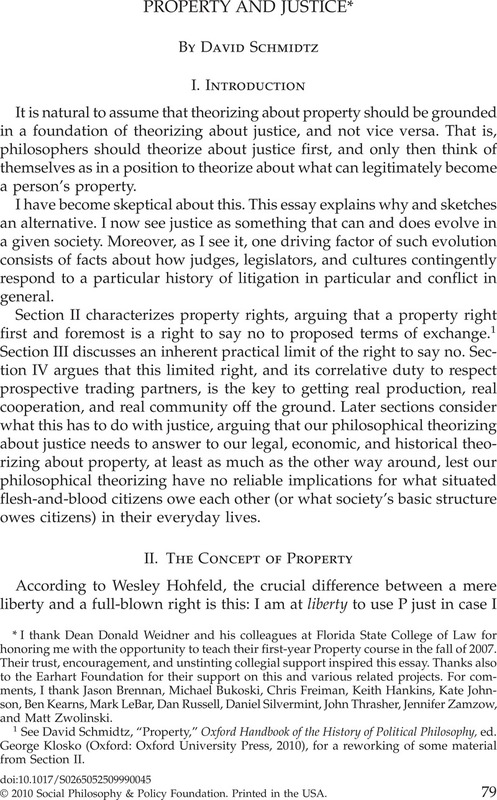 1 See Schmidtz, David, “Property,” Oxford Handbook of the History of Political Philosophy, ed. Klosko, George (Oxford: Oxford University Press, 2010), for a reworking of some material from Section II. 2 Hohfeld, Wesley, Fundamental Legal Conceptions (New Haven, CT: Yale University Press, 1964; first published in two parts in 1913 and 1917). 3 Blackstone, William, Commentaries on the Laws of England (Chicago: University of Chicago Press, 1979; first published 1765), book II, chapter 1. 4 Lewis, John, Law of Eminent Domain (Chicago: Callaghan and Co, 1888). 5 Calabresi, Guido and Melamed, A. Douglas, “Property Rules, Liability Rules, and Inalienability: One View of the Cathedral,” Harvard Law Review 85 (1972): 1089–1128. 6 Spur Industries v. Del Webb, 494 P.2d 700 (Ariz. 1972) is a notorious case in which housing developer Del Webb sued neighboring feedlot operator Spur industries, alleging that Spur's operation was a noxious nuisance that was damaging property values and making neighborhood life unpleasant. Spur Industries had been operating long before Del Webb showed up, though, which is part of the reason why Del Webb was able to buy the land so cheaply in the first place. The basic principle of common law is that if a party moves to the nuisance, as Del Webb did, then it has no complaint. Yet the judge ruled that although Del Webb per se did not have a case, Del Webb's customers were “the public” and the public has a right to be protected against noxious and potentially unhealthy nuisances. Thus, the judge ruled for Del Webb, granting an injunction against feedlot operator Spur Industries. Remarkably, the court held that winning plaintiff Del Webb had to compensate Spur, not the other way around. The court judged that Spur's property claim was valid but that (because the feedlot was a public nuisance) Spur could be forced to move, with compensation, because Spur's property right was, in effect, protected by a liability rule rather than a property rule. Interestingly, the case was settled within a month of the publication of Calabresi and Melamed's article; the judge had not read it. For further information, see almost any casebook on property. I have used Merrill, Thomas and Smith, Henry, Property (New York: Foundation Press, 2007). 7 Hinman v. Pacific Air Transport, 84 F.2d 755 (9th Cir. 1936). 8 See, e.g., United States v. Causby, 328 U.S. 256 (1946). 9 Schmidtz, “Property,” discusses the Hinman case as an example of a decision driven by the imperative to limit transaction costs—namely, the various costs (transportation, packaging, advertising, and so on) of getting a product to market and then into the hands of customers—to manageable levels. 10 I thank Matt Zwolinski for pressing for clarification here. 11 Michael Walzer has asked me where I stand on issues of rectificatory justice. What are we to do about the histories of unjust expropriation that we find everywhere we look? There comes a time when it is too late and such histories cannot be undone. When it is too late to make victims whole, rectificatory justice has to be about something else. It has to be about enabling people to repair broken relationships, reconcile, forgive, understand exactly where their culture has been and where they resolve never to be again, so that they can get on with their lives together. So my answer to Walzer is that he was correctly interpreting my view: our need to be able to coordinate and cooperate, going forward, shapes the interpretation of all principles of justice, including principles of rectificatory justice. See Radzik, Linda, Making Amends (New York: Oxford University Press, 2009); and Griswold, Charles, Forgiveness (New York: Cambridge University Press, 2007). 12 Holmes, Stephen and Sunstein, Cass R., The Cost of Rights: Why Liberty Depends on Taxes (New York: Norton, 1999), 15. To elaborate, “Property rights have costs because, to protect them, the government must hire police officers” (ibid., 146). The government takes responsibility, at considerable expense, in three ways: first, when it pays the officers; second, when it trains the officers to respect the rights of suspects; third, when the government monitors police (and other public officials, presumably) so as to deter rogue officials and generally minimize corruption (ibid.). 13 Jason Brennan and I elaborate on the traffic light and traffic management metaphors in Schmidtz, David and Brennan, Jason, A Brief History of Liberty (Oxford: Blackwell Publishers, 2010). 14 When I speak of putting people in a position where they know what to expect from each other, this may seem to privilege the status quo. I am of two minds about this. First, I think the often-expressed concern about privileging the status quo often is misplaced. Acknowledging that we start where we actually start is a bias in a sense, because it rules out places we cannot get to from here, but it is not an arbitrary bias. If we rule out options on the grounds that we cannot get there from here, we are ruling them out for good reason. Second, if there is anything conservative about this approach, it is the thinnest kind of conservatism. The point is that we start from where we are, not that we have any reason to stay where we are. Wherever we want to go, if we are serious, then we will take seriously questions of whether we can get there from here, and if so, how. 15 I thank Daniel Bell for the question. 16 I suppose age would be one of the best demographic predictors of car ownership, as it is of income in general, and for the same reasons. It takes years to accumulate capital, including the most valuable job skills. 17 Egalitarian theorists such as Richard Arneson (in a series of articles on the various currencies of egalitarianism, and on alternatives that simply prioritize the claims of the destitute), and Christiano, Thomas, in The Constitution of Equality (Oxford: Oxford University Press, 2008), and The Rule of the Many (Boulder, CO: Westview Press, 1996), are helping to take political philosophy to places it has never been before. Each in his own way seems to be developing principles of egalitarian justice that are not recipes for gridlock—that could be implemented in ways that would unleash producers without leaving young pedestrians permanently on the outside looking in. 18 Ackerman, Bruce A., Social Justice in the Liberal State (New Haven, CT: Yale University Press, 1980), 31. 19 Holmes and Sunstein, The Cost of Rights, 15. 20 John Rawls was ahead of his time in insisting that we must not think of the pie as fixed and must construct our redistributive principles with a view to the fact that what people produce will depend on the extent to which we treat their product as their property. Rawls also, unfortunately, insisted that people's productive capacities were among the morally arbitrary properties of persons that did not figure directly into the question of what they rightfully could claim as their due (from society's basic structure). See Rawls, John, A Theory of Justice (Cambridge, MA: Harvard University Press, 1971), 74–75. 21 Holmes and Sunstein, The Cost of Rights, 29; emphasis added. 23 It seems the “libertarian fiction” is a fiction written about libertarians, not by them, which may account for why (aside from two sentence fragments on page 1 of The Cost of Rights, ascribed to contemporary policy experts Charles Murray and David Boaz) no libertarians are ever cited. Nowhere do Holmes and Sunstein acknowledge that the classical liberals to whom they allude (without ever naming them, and frankly I doubt they have anyone specific in mind) are the most cost-conscious rights theorists who ever lived. (It would make sense to at least mention Friedrich Hayek, James Buchanan, Richard Epstein, Thomas Sowell, Daniel Shapiro, Scott Arnold, Jan Narveson, Robert Sugden, or even left-libertarian Hillel Steiner, just to name a few.) Holmes and Sunstein write: “Some of those who wince at the very mention of the cost of rights may distrust close inquiry into the tradeoffs that rights enforcement inevitably entails” (ibid., 177). Holmes and Sunstein insinuate that classical liberals and conservatives are the ones who wince, but nothing could be further from the truth. Classical liberals have always done more than anyone to warn us that few alleged rights are worth the cost. Holmes and Sunstein themselves do not actually do anything in this regard. Their only reason for belaboring this theme is that it is the closest thing they have to an argument that rights are created by government, and that it is the government's prerogative to decide what we owe government in virtue of such protection. 24 Holmes and Sunstein, The Cost of Rights, 15. 26 Ibid., 60; emphasis added. 27 Holmes and Sunstein write: “No sharp line can be drawn between markets and government: the two entities have no existence detached from each other” (ibid., 69). Likewise, Liam Murphy and Thomas Nagel write that because “[t]here is no market without government and no government without taxes … [i]t is therefore logically impossible that people should have any kind of entitlement to all their pretax income.” Murphy and Nagel, The Myth of Ownership (New York: Oxford University Press, 2002), 32. My best guess from the context is that this is a maximally provocative way of saying that governments do not function well in the absence of a price mechanism and markets do not function well except in the context of enforceable contracts. 28 Even the idea that laws are exclusive creatures of government is hard to believe unless it is stipulated to be so by definition. Mutual understanding and coordination, based on mutual acknowledgment of one another's possessions, has always been mostly a spontaneous matter, just like language, not generally or primordially a creation of government. And such coordination does, in fact, give rise to expectations that community members treat as legitimate, with at least as much status within communities as the sorts of expectations that later in human history come to be created by governments as well. 29 Costs “will be understood to mean budgetary costs and ‘rights’ will be defined as important interests that can be reliably protected by individuals or groups using the instrumentalities of government” (Holmes and Sunstein, The Cost of Rights, 16). 30 Ibid., 120; emphasis added. 31 Echoing Holmes and Sunstein, Murphy and Nagel write: “Few would deny that certain positive public goods, such as universal literacy and a protected environment, that cannot be guaranteed by private action, require government intervention” (The Myth of Ownership, 6; emphasis added). What a curiously old-fashioned approach this seems to be, as if there were no gap between finding a theoretical imperfection in private provision and clinching the case for public provision. Perhaps Murphy and Nagel assume that public provision has a record of perfection in these areas. More likely, they assume that public providers need not achieve perfection, because public providers (and only public providers) have their hearts in the right place, which suffices to make public provision just. 32 If there were one thing people needed from a government, it would be to give some teeth to the right to say no. And the right to say no won't have teeth except under a government that treats possessions as presumptively legitimate—defeasible, of course, but not in fact defeated in normal cases. 33 Holmes and Sunstein, The Cost of Rights, 18. 34 See http://www.elderweb.com/home/node/2838, citing data from the U.S. Census Bureau's Current Population Reports. 35 Aiming at near-universal literacy is one thing. Aiming to eradicate polio is one thing. I am open to arguments that such aims are altogether legitimate, even at significant cost. Even so, the aim itself is the thing. Guarantees are neither necessary nor sufficient. 36 See, e.g., Ellickson, Robert C., “Property in Land,” Yale Law Journal 102 (1993): 1315–1400; Rose, Carol, “Possession as the Origin of Property,” University of Chicago Law Review 52 (1985): 73–88; Rose, Carol, “The Comedy of the Commons: Custom, Commerce, and Inherently Public Property,” University of Chicago Law Review 53 (1986): 711–87; and Ostrom, Elinor, Governing the Commons: The Evolution of Institutions for Collective Action (Cambridge: Cambridge University Press, 1990). 37 The term ‘compossible’ is most often associated with Hillel Steiner. I think the idea comes originally from Leibniz, but Steiner fruitfully applied it to theories of rights. The idea of rights being compossible is that it cannot be true that a person both does and does not have a claim to X. When rival claims are not compossible, then at least one of the rival claims has to be incorrect, or in any case must be reinterpreted or repudiated so that the rival claims no longer contradict each other. Where I disagree with Steiner is in thinking that this truth is more fruitfully regarded as a contingent truth than as a necessary one. I think judges and legislators affirm rights claims all the time that turn out not to be compossible, and, as I see it, compossibility in a system of rights is an achievement, not a given. Judges, legislators, and other agents have to work to make sure that rights claims are compossible enough to enable agents to avoid conflict while still taking seriously their rights as affirmed by judges and legislators. 38 Avner de-Shalit has asked me about the status of principles of justice that in particular cases fail to fit nicely into a system of traffic management. There are no guarantees. Quite the contrary. Judges face such cases from time to time and have to make decisions nonetheless. What often seems to guide them, and I would say rightly so, is a desire to avoid doing anything that appears too creative. They want their rulings to be what people would or should have expected under the circumstances. The law does a better job of managing traffic, other things equal, to the extent that it is predictable. Sometimes the justice of a ruling is controversial. Sometimes it would have been controversial regardless of which way the judge ruled. Sometimes the ruling is a net loss for society in a particular case, and sometimes, nonetheless, the ruling is correct—insofar as it is fair, it is what people should have expected, and it is in keeping with the kind of overall rule of law that keeps the traffic moving as smoothly as can be reasonably expected. 39 Gerald Gaus, “Coercion, Ownership, and the Redistributive State: Justificatory Liberalism's Classical Tilt,” elsewhere in this volume. 40 Here is a common view that in a subtle way denies the liberal premise of self-ownership. Holmes and Sunstein say that the ACLU (American Civil Liberties Union) is tax exempt, “which means its activities are partly financed by the public.” Holmes and Sunstein later say that “a tax deduction is a form of public subsidy” (The Cost of Rights, 21, 66). If this is meant as a substantive claim, though, it is indefensible. The truth is that if a dollar belongs to George Washington, and George uses that dollar to finance project X, then George is subsidizing project X. But if the dollar that Patrick Henry is investing in the ACLU belongs to Patrick, then it is Patrick's dollar, not George's, that is subsidizing the ACLU, and we do not change that fact by noting that George is powerful enough to take it from Patrick but decided not to. To say that the tax deduction is a public subsidy is to presume, rather than to argue, that the public owns the dollars that it sometimes declines to take from Patrick. Perhaps there is an argument for this, but to assert without argument that deductions are subsidies is to try to bully readers into not asking for the argument. Thus, there is a basic choice, and a defining choice for liberalism: Does George need to justify taking Patrick's possessions, or does George need to justify not taking them? 41 Murphy and Nagel say that “we cannot be said to deserve outcomes for which we are in no way responsible. Thus, to the extent that market outcomes are determined by genetic or medical or social luck (including inheritance), they are not, on anyone's account, morally deserved. Since nobody denies that these kinds of luck at least partly determine how well a person fares in a capitalist economy …” (The Myth of Ownership, 32). But to be lucky is not to be “in no way responsible.” What cuts against being deserving is not being lucky, but rather being merely lucky. See my “How to Deserve” (1982), updated in Schmidtz, , The Elements of Justice (Cambridge: Cambridge University Press, 2006), and in Schmidtz, , Person, Polis, Planet: Essays in Applied Philosophy (New York: Oxford University Press, 2008). 42 Murphy and Nagel, The Myth of Ownership, 176. 43 See Tomasi, John, Liberalism Beyond Justice (Princeton, NJ: Princeton University Press, 2001). I thank Dean Donald Weidner and his colleagues at Florida State College of Law for honoring me with the opportunity to teach their first-year Property course in the fall of 2007. Their trust, encouragement, and unstinting collegial support inspired this essay. Thanks also to the Earhart Foundation for their support on this and various related projects. For comments, I thank Jason Brennan, Michael Bukoski, Chris Freiman, Keith Hankins, Kate Johnson, Ben Kearns, Mark LeBar, Dan Russell, Daniel Silvermint, John Thrasher, Jennifer Zamzow, and Matt Zwolinski.